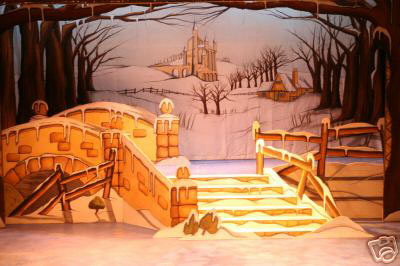 This is a full stage set for the pantomime "Cinderella". It includes everything except the false Pros. Although the Beautiful Gondola Coach is included, the hirer would need to organise whatever means they wish this to be pulled by i.e. Ponies, Swans, Dancers etc to individual requirements and budgets. 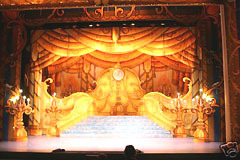 The set ideally suits a stage size 7.2 metres wide x 8 metres deep, and the cloths etc are more suited to a theatre with flying facilities. 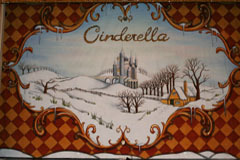 The set consists of a SHOW CLOTH with the wording 'Cinderella' featured. 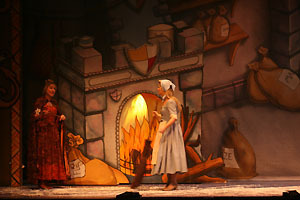 The cloths then go upstage with A PICTURE GALLERY CLOTH, A SCULLERY SCENE CLOTH, A KITCHEN GAUZE, A TREE HEADER FOR THE WOODLAND SCENE, A PALACE CUT CLOTH, A PALACE FULL CLOTH, and finally upstage there is a WOODLAND BACKDROP. 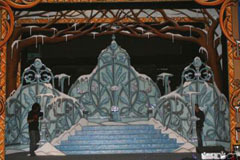 The opening scene as seen on the first photo above has steeldecking at the back ( not included ) with treads down onto the main stage. There are flats to cover the front of the decking and the sides of the steps. The KITCHEN GAUZE has a Chimney Fireplace Truck and a Flatage Ground Row. 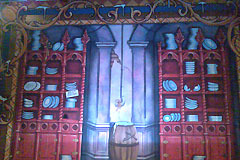 This is set up behind the SCULLERY CLOTH. For the transformation scene, the decking flatage and the treads are changed. 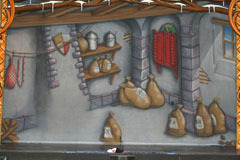 The carriage is a large Gondola. The Palace Ballroom uses the same treads. 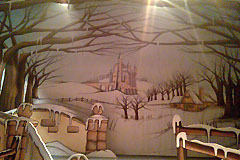 The decking flatage is changed and the Backdrop is at the back. There is a CLOCK FLAT in front of this, and the hands are functional and actually move. The Finale Walkdown is the same treads but with flatage. This back flatage is flown. Note: The square photo in the PICTURE GALLERY CLOTH is a gauze piece, and ideal for use as a Ghost Gag Scene. 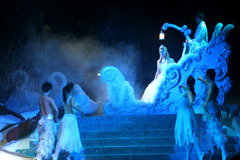 The stage lighting can be used to great effect to show the Ghost through the picture gauze and can then revert back to the main picture. 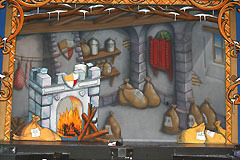 Also the SCULLERY SCENE CLOTH has the feature of small light bulbs holders around the two dressers (4 vertical rows on each), that can show the added effect of the cloth being 'lit' if required. 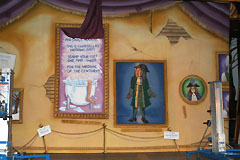 Cinderella Opening Cloth, Picture Gallery Cloth, Scullery Scene Cloth are 32 feet x 23 foot drop. Woodland Scene Cloth is 34 feet x 16.5 foot drop (this is shorter due to the steel decking needed and supplied by the hirer). 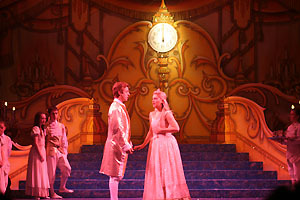 Ballroom cloths are 30 feet x 16.5 foot drop. The set would need collecting from Ellesmere Port, Cheshire. The hirer would need to arrange an articulated lorry for collection. Hire price is per week, although reductions are given for long hires. Please email info@backcloths.com for rates. Note: The set may be split, ie if only a Ballroom Scene or Kitchen Scene is needed. 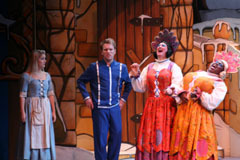 However, priority booking is given to hirers of the FULL SET during the traditional Panto Season (November - February).